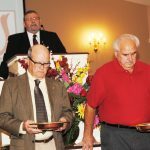 On Sunday, October 16, a special ceremony was held during the morning worship service at the Hamer Church of God. 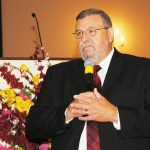 Pastor Joey Nelms opened the service with a prayer followed by a song and the offering. Pastor Nelms spoke of the Home for Children located in Mauldin, S.C., and the love he had for children. Charles Wilkerson of the Hamer Church of God was in the MIP Program for the church. While there, Wilkerson had to do a local mission. And, of course, Pastor Nelms first suggestion was the Home for Children. Pastor Nelms also made other suggestions. Brother Wilkerson began his mission in February, 2016 and concluded in September, 2017. 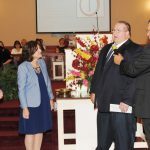 Pastor Nelms proudly announced that Charles Wilkerson of the Hamer Church of God would be making a check presentation of $10,600.00 which exceeded his goal. 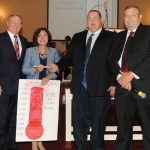 Brother Tim and Sister Kim Kerns from the Home for Children were present to receive the check which will be used to assist in purchasing necessary transportation for the Home for Children. The Home for Children are desperately in need of 3 vans of which one has been purchased. This money will enable them to make a down payment on a second van. Brother Tim and Sister Kim Kerns have been serving at the Home for almost 2 and 1/2 years after he served as a pastor for 35 years. The Hamer Church of God is located at 2410 Hwy. 301 North, Hamer, S. C.